With data scientist and statistician among the fastest growing jobs, organizations in nearly every industry and sector are hunting for the best and brightest. Citadel, the $26 billion hedge fund, and Citadel Securities, a leading market maker, are no different, but their approach is somewhat unique. The firms are sponsoring 18 data science competitions at universities across the U.S., U.K. and Ireland, with a grand prize of $100K. Carnegie Mellon University’s Department of Statistics — a top-rated and one of the fastest growing programs — will host the Citadel/Citadel Securities Datathon, powered by Correlation One, on March 25 in Baker Hall’s Giant Eagle Auditorium (BH A51). 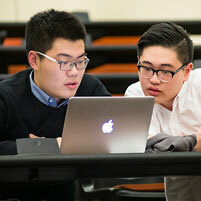 Approximately 125 students, with majors ranging from statistics to computer science and economics, have been selected to compete for a cash prize pool of $25K. Top performing teams will travel to New York City in November for "The Data Open" which carries the $100K grand prize, and they will be eligible to interview for careers with Citadel and Citadel Securities. "We are deeply committed to the field of data science and are excited to connect with talented people across disciplines and levels of education through these competitions," said Justin Pinchback, head of Talent Strategy at Citadel. "Carnegie Mellon has a strong track record of producing top quantitative and technical talent, and we look forward to seeing these students showcase their skills and talents." CMU’s Statistics Department, which is celebrating its 50th anniversary, is an epicenter for training the next generation for data scientists. The number of students majoring in statistics as well as interdisciplinary degrees in areas such as economics, machine learning and neuroscience has more than doubled over the past six years. And students are taught by world-class faculty members who not only contribute to the field of statistics but also apply it science, policy and other areas. The department has hosted similar events through the Tartan Data Science Cup over the past year and a half, but never with such a large award. "The Tartan Data Science Cups, the Citadel Datathons, the American Statistical Association Datafests and competitions like these gives students valuable real world experience. They apply what they've learned in the classroom about manipulating data and computation, use visualization and statistical modeling techniques to build an analytical argument, and then write about and present their work in teams — all in a condensed period of time,” said Rebecca Nugent, associate department head of the Statistics Department, teaching professor of statistics and director of undergraduate studies. Because of the growing interest in this area on campus, the Carnegie Mellon Data Science Club was recently launched. The club’s purpose is to serve as a platform for students to pursue their interests in data science in a setting that is both collaborative and competitive. Citadel has an ongoing presence on Carnegie Mellon’s campus through the Citadel Teaching Commons, an innovative study space and computer lab located in CMU’s School of Computer Science. Citadel provided funding for the construction of the Teaching Commons, which was completed in 2015. Learn more about the Citadel/Citadel Securities Datathon, powered by Correlation One. MEDIA: If you are interested in attending the datahon, please register with Shilo Rea or call 412-268-6094.